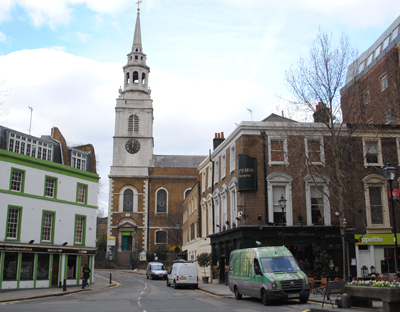 The Church of St James, which stands just to the north of Clerkenwell Green, is all that remains today of the medieval nunnery which once occupied a large swathe of land in the area. The Augustinian Nunnery of St Mary was founded in about 114o by Jorden de Briset, the lord of Clerkenwell Manor (he also founded the Hospitaller Priory of St John of Jerusalem which lay to the south – more on this here) on 14 acres of land to the east of the famous “Clerk’s Well” (more on the well, which was located close to, but within, the western border of the nunnery, in our earlier post here). By 1160 a wall had been built around the precinct said to have been roughly bounded by Farringdon Lane, Clerkenwell Green (an open space between the two religious houses), St James’s Walk and a boundary to the south of, and parallel with, Bowling Green Lane to the north. The church – where Briset and his wife were later buried and which doubled as a parish church – was built about the same time, along with an adjoining chapter-house – both of which were made of stone in contrast to the timber buildings which initially made up the rest of the complex. A cloister and other stone buildings were erected to the north of the church later in the 12th and 13th centuries including a lodging for the prioress, a dormitory, refectory and kitchen for the nuns. Other buildings on the site included a gatehouse, what was known as the “Nun’s Hall” – possibly a hall for guests – and an infirmary with its own chapel, the location of which is apparently something of a mystery. Substantial renovation works were carried out in the late 15th and early 16th centuries and by the time of King Henry VIII’s dissolution, it had become one of the wealthiest monasteries in England (although it only ever housed about 20 canonesses). One of the last nunneries to be suppressed, it was dissolved in 1539 with the nuns being pensioned off. The site was initially granted to Thomas Howard, 3rd Duke of Norfolk, who held it only briefly being returning it to the king in a deal for another property and subsequently purchased by a succession of different owners. Many of the buildings were converted for use as private mansions and outbuildings, among them Newcastle House and Challoner (later Cromwell due to the legend that Oliver Cromwell resided there) House which faced them across what had been the cloister courtyard. The mansions were gradually redeveloped into smaller properties – it remained a popular residential area despite the building of a House of Detention to the immediate north – and in 1788-92, the parish church of St James was rebuilt to the designs of local architect James Carr, with the spire apparently modelled on St Martin-in-the-Fields (Carr also bought Newcastle House and pulled most of it down before redeveloping the area). Church gardens, which are open to the public, now occupy some of the site of the former nunnery – in 1987, part of the medieval cloisters were excavated here. For some insightful walks delving into the history of London, see Stephen Millar’s three books, London’s Hidden Walks: Volumes 1-3 .